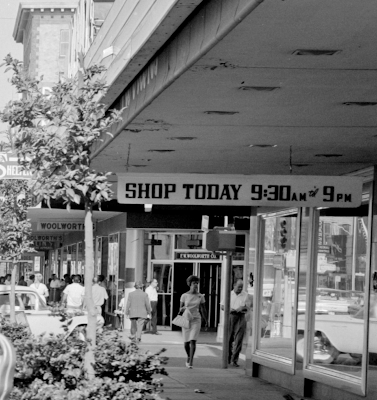 Let's walk in downtown Phoenix in 1963. There are stores all along Washington Avenue, including Woolworth's, and there are plenty of people walking. Personally, I never saw any of this. By the time I got to Phoenix, in 1977, this type of vibrant life had long since passed. Whether there were stores then I have no recollection, I just recall how horrible downtown Phoenix looked, and I got out of there right away. So images of it before the 1970s fascinate me, and I want to step into them. We're walking west on Washington, looking towards Woolworths, which is at 1st Street in 1963. See the signs? Oh yes, right behind her. I see her. I'm not blind, you know! Calm down now, that's just the style women are wearing now. This isn't the fifties anymore you know, it's the swinging sixties! Even though it's fall, it's still warm and sunny and the deep overhangings on the stores are appreciated. They go all of the way out over the very wide sidewalk, and that makes a difference when walking. Shade is so important! Of course in the summer, even the roll-down curtains aren't really enough, but it does help. The stores are open late, so it's better to go shopping at night. Parking is kind of a hassle, and always has been in downtown Phoenix, but I just put a nickel in the meter so we should be fine for a while. Yes, I understand that you can park for free in the lots of the new malls, and I figure that will be the end of the downtown stores. Most of the people I know are now shopping at the new malls. Let's go into Woolworth's, I want to look around. I'll buy you a malted. Thank you for walking in downtown Phoenix in 1963 with me! Image at the top of this post: Looking west on Washington towards 1st Street in 1963, Phoenix, Arizona.